This is a refreshing cold cucumber soup with a bit of a kick (adapted from Food & Wine Magazine) and if your CSA share always has a lot of cucumbers like the Accidental Locavore’s always does, this is a good way to use them. Put all ingredients in the work bowl of a food processor or blender. Process until it’s as smooth as you like (I like mine a little coarse). Chill. 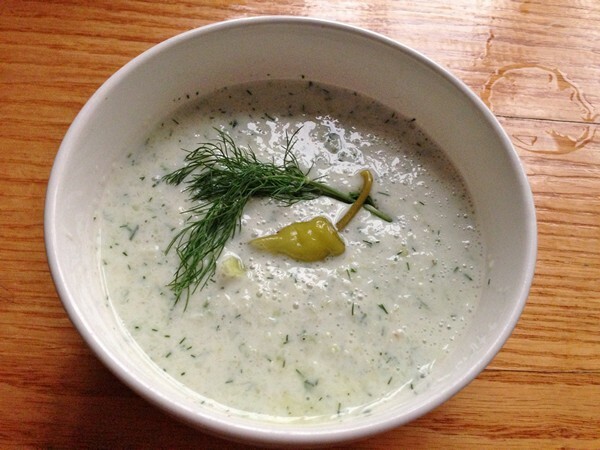 Serve the cucumber soup with extra pepperoncini and dill as garnish and enjoy! My verdict: This cold cucumber soup has become a go-to because our CSA share often has pounds of cucumbers (and if some of them are pickling cukes, use the extra dill for quick pickles). It may seem like a lot of heat so if you don’t like a lot of spice, add the pepperoncini a couple at a time and taste it as you go along. Same with the cumin. If you have extra buttermilk it can actually be frozen and I measure out 1 cup portions and freeze them in Ziploc bags. Lay them flat in the freezer and then you can stack them (takes up less space than round containers). Or, if you’ve got some heavy cream, make your own créme fraîche. Previous post: Accidental Locavore Farmbasket Week 7: Does Size Matter?